When I returned to Jordan in May 2010 from Morocco I was staying at a hotel in downtown that was run by relatives of Atef (not the hotel that I ended up working in). The hotel is separated into two buildings, one building being more hostel style and in the budget range (where I was staying) and the other building providing 2 star rooms. The lounge-room area for both buildings is in the downstairs part of the hostel style building. One morning I was sitting in the lounge-room talking with Atef’s uncle when a young couple that were staying in the 2 star building came in and said that there was sometime in their bath tub and that someone needed to come to their room. Being curious I followed Atef”s uncle and the young couple to the building next door and up to their room. Low and behold in their bathtub was a scorpion. I convinced Atef’s uncle not to kill it on the spot, raced back downstairs, grabbed my camera and raced back upstairs. I had to get a photo. According to Atef’s uncle whilst this fellow would give you a nasty sting, he wouldn’t kill you. He told me that with scorpions the smaller and more yellow they get the deadlier they are. This fellow being bigger then the plug hole and dark brown wasn’t considered to be in that deadly category. Now I wish that this is where the story ended but it doesn’t. 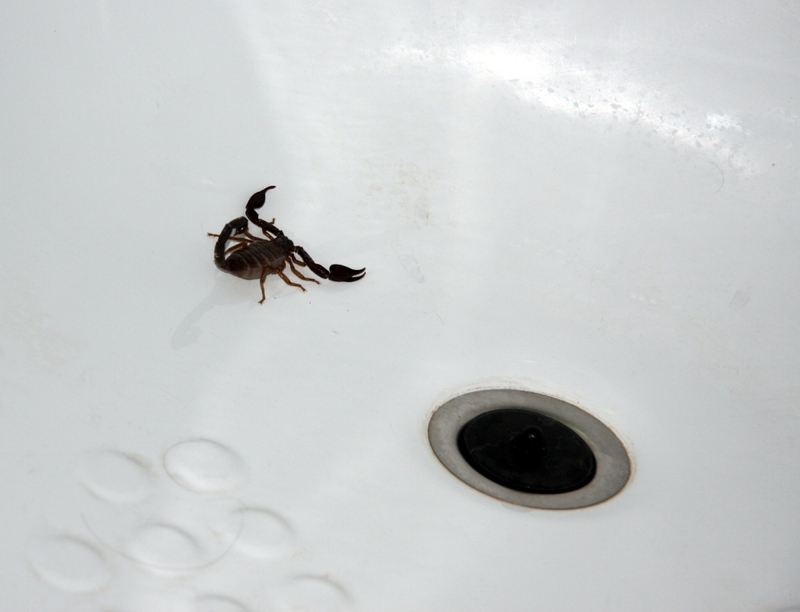 Less than a week after this fascinating encounter with the scorpion in the bath tub I experienced a not so fascinating encounter. I was taking a shower in my room at the hotel. I finished up and grabbed my towel which was draped over the sink. I felt something crawl on my hand and looked down to see what I considered a small (definitely smaller than the one in the bath tub) and decidedly yellower scorpion. I screamed (blue murder) as I flicked my hand and the offending scorpion and the towel towards the door of the bathroom. 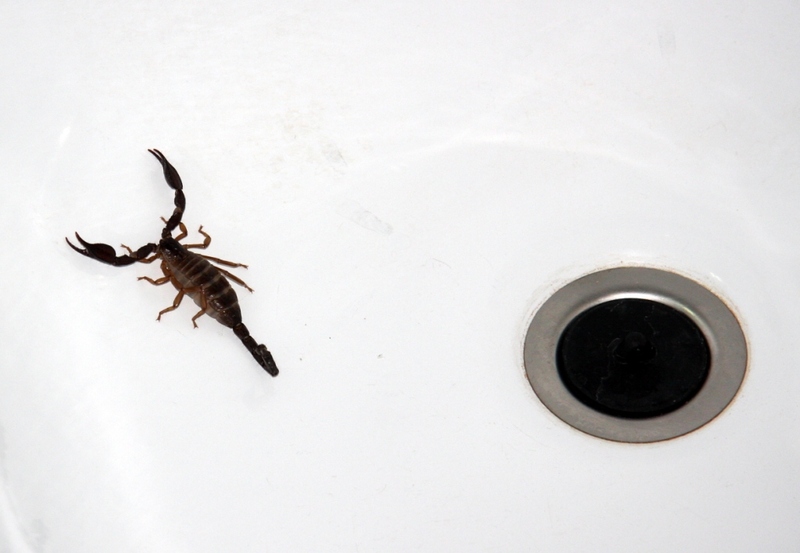 Bad move – there was now a scorpion between me and my escape route out of the bathroom. I’m standing in the bathroom wet and cold, but too afraid to pick up the towel in case the scorpion that I could see had bought his friends with him, screaming and sobbing hysterically convinced that I was going to die. My scream had bought Atef’s uncle and the receptionist who were downstairs in the lounge-room up to my room. They were knocking on my door and asking me what was happening and all I could do was yell back scorpion and continue to scream and sob hysterically. At this point the scorpion decided that he was getting out of the bathroom and heading for safer (and quieter) ground, so under the crack in the door and into my room he went. This did nothing to calm me down as now I didn’t know where the scorpion was but was certain that it was just on the other side of the door plotting my demise or finding itself a nice hidey spot to surprise me later! Atef’s uncle and receptionist are still knocking on the door trying to get me to calm down, still not really knowing what has happened. Bordering on being paralysed with fear and hysteria, only the thought of not wanting to be found curled up naked on the bathroom floor snapped me back to some sort of reality and I cautiously opened the bathroom floor. The scorpion hadn’t gone far and as I opened the bathroom door it pushed the towel out of the bathroom and along the floor towards the door of my room. The scorpion high tailed it under the towel. I jumped onto my bed once again screaming and sobbing hysterically as now the scorpion was between me and my escape out of the room. Atef’s uncle and the receptionist had given up knocking on the door and instead had gone outside to the window of my room. They yelled up to me to drop my room key out the window. I had a better idea. I hastily threw some clothes on (that I could reach standing on the bed) and using the chair and the desk went to the window. Instead of dropping the key out the window I threw myself out of the window. Fortunately I took the room key with me and that my room was only on the first floor! Mind you I still think that I would have gone out the window even if I had been on a higher floor. Atef’s uncle returned to my room and killed the scorpion which according to him wasn’t all that small or yellow (I’m sure that he was just saying this to make me feel better!) My things were packed up and I moved into a new room. I’m still laughing. I have to admit scorpions (and spiders) are my greatest fear. I’ll also admit to googling any new location to find out if they have deadly scorpions or spiders so I can obsess about it while I’m there. I can’t tell you how many times I shook out my bed/clothes, etc. when we were camping in the desert despite everyone’s assurances that it was too early in the season. There IS a season, right? That’s what I’ve been told and it’s what I keep telling myself every time I’m outside and moving about the rocks! Apparently they don’t like cold weather and that suits me just fine! !